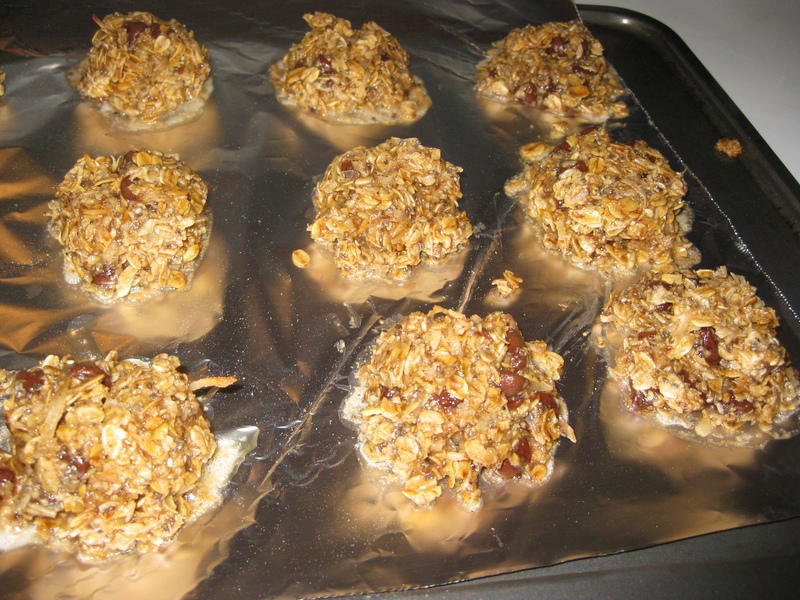 I made these lactation cookies a few weeks ago and greatly enjoyed them! I got the recipe from here and changed/added a few things. I had a special helper in the kitchen too! 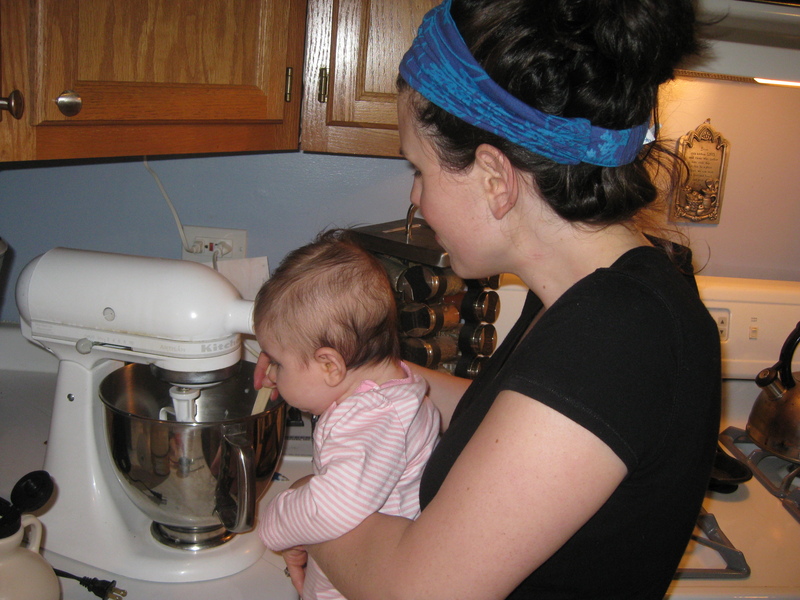 Before you stop reading this because you are not breastfeeding, please note first that Sam loved these cookies and a lot of these ingredients I include in my diet everyday (even when not breastfeeding). They are a special treat for anyone looking to get more protein, fiber, omega 3, and antioxidants in their diet in the form of a tasty treat. If you are breastfeeding all of these ingredients help aid greatly in the lactation process (especially the oats, nutritional yeast, and flaxseed). 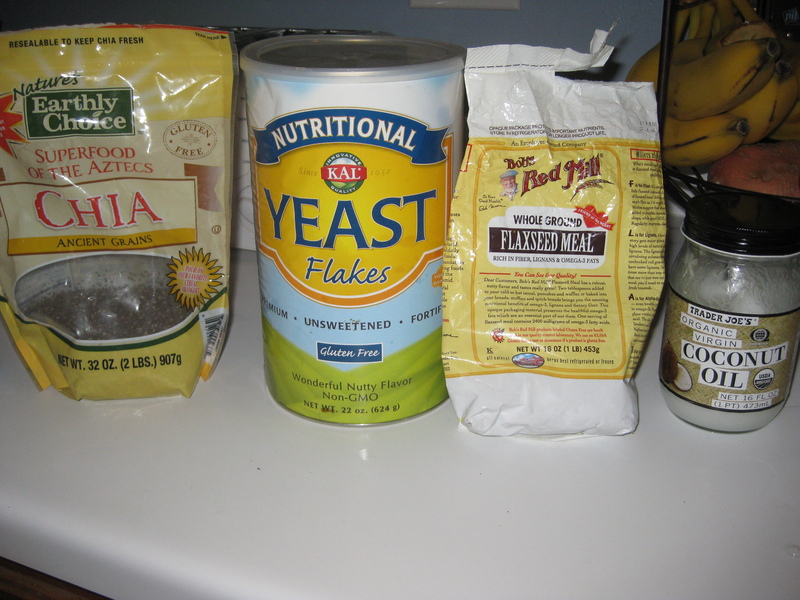 Nutritional Yeast: Contains many essential amino acids and B vitamins (Tastes similar to cheese easy to incorporate on salads, pastas, popcorn). Flaxseed: Fiber, antioxidants, and omega 3 (Easy to include in baked goods such a muffins, or in your oatmeal in the morning). Coconut Oil: Beneficial to heart and skin (Substitute when using other oils). Combine flax seed with water and set aside, allowing to gel for about 10 minutes. In large bowl, combine all ingredients including flax seed gel, and refrigerate for 15 minutes. Remove cookie dough from fridge and roll into bite sized balls. Place on foil lined baking sheets and bake for 9 to 11 minutes. Allow cookies to cool for about 5 minutes. Then reshape into balls and place on cooling racks in the fridge or freezer. Once cooled, place on plate, and enjoy! I finally got to go in and visit Westminster, the school I previously taught at. It was so good to see all my students and staff again!! I have missed them a lot. 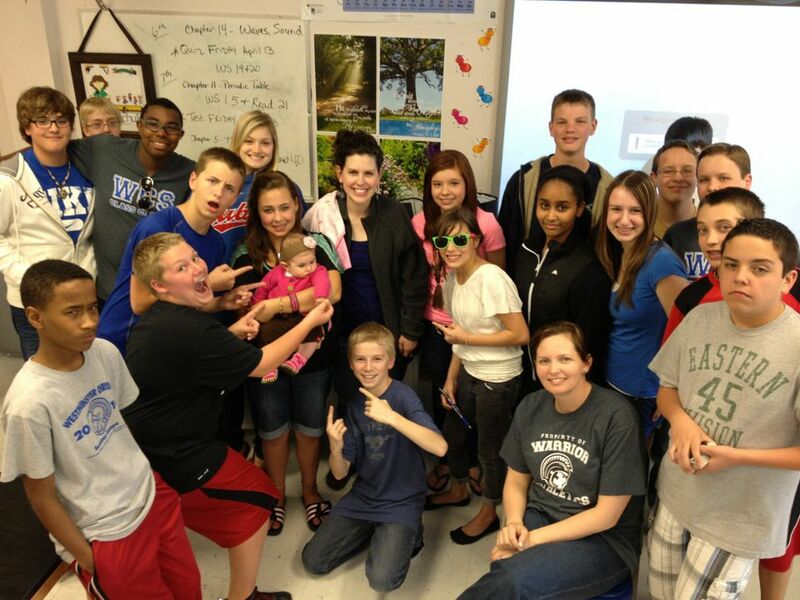 Malayna enjoyed meeting everyone. Check them out! On this Good Friday I want to leave you with a really good quote that convicted me this week from the book Respectable Sins. I have always known gossip and complaining were wrong, but I never really thought of the effect it has on the person you are speaking to. This quote was challenging to me to remember that I am corrupting the mind of my listener when I gossip or complain. I especially liked how he stated when we complain we are questioning the goodness of God! Thank you Jesus for dying for me so many years ago to save me from my sinful state. Happy Easter Everyone! 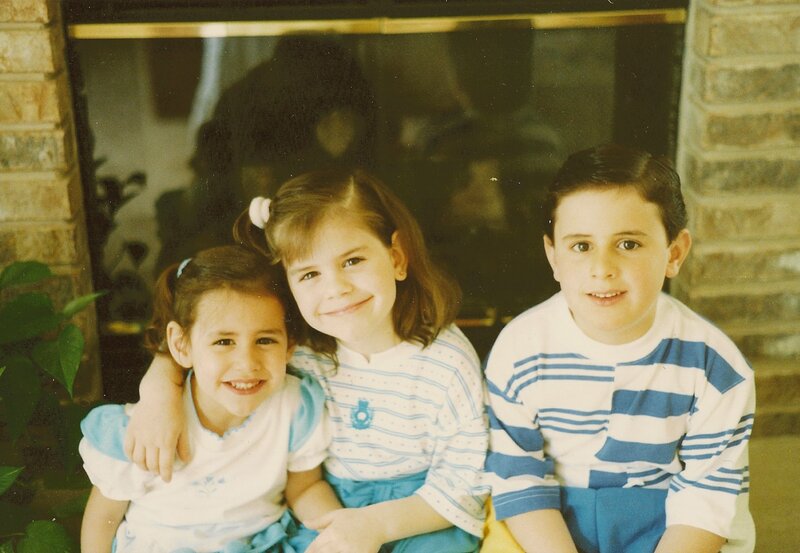 I hope you enjoy a little flashback to when Steve, Lauren, and I were kiddos! By the way, Steve and I always sent Lauren to “cutie jail” when we were younger because she was so cute. I mean look at her! Do you think I could wear my hair like that again? Nice post! That statement in the book stuck out to me also! It’s an interesting title to the book… “Respectable Sins” no Sin is respectable to a holy God but we as sinfull people tend to think some Sins are more respectable than others…for instance anger… we tend to shrug it off and say “it’s not that big of a sin” and compare it to something like Adultery. We think how could you commit adultery and think that’s a lot worse than anger but to GOD, it’s the same, Jesus illustrates this point in Matthew Ch 5 vs 27-28. What a challenge ahead of us as we study Gods word and read this book and study questions! Oops…by the way could you guys all be any cuter in that photo of you, Lauren and Steve? Katie these look so yummy! This is going to sound psycho but for the 65 months I’ve been a mom there I have only not breastfed 2 of those. (crazy I know). I will definitely have to give these cookies a try!